You thought the cases were closed, relegated to a past that was best left forgotten. Beginning with a search for two missing Miskatonic University professors, your inquiries in The Dunwich Legacy launched you on a campaign that led from the infamous Clover Club to the decrepit streets of Dunwich and realms beyond. But questions from these strange investigations still linger, compelling you to board the train to Dunwich once more. 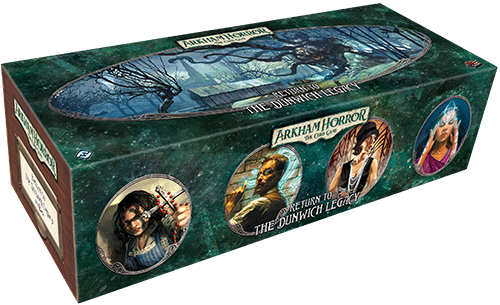 Return to the Dunwich Legacy invites you to re-open your old case files and experience the first full-length campaign for Arkham Horror: The Card Game with fresh eyes as you encounter new challenges and new surprises. Across this expansion’s 81 new scenario cards and 23 new player cards, you’ll explore new locations, face more ghastly treacheries, and enhance your investigator’s abilities as you struggle to stop even more unspeakable terrors. Finally, Return to the Dunwich Legacy also features a premium box and thirty-two divider cards to conveniently store your complete campaign in a single place. Pick up your own copy of Return to the Dunwich Legacy at your local retailer or online through our website today!